For the peak named after Bolivar in Colombia, see Pico Simón Bolívar. Pico Bolívar is the highest mountain in Venezuela, at 4,978 metres (16,332 ft). Located in Mérida State, its top is permanently covered with névé snow and three small glaciers. It can be reached only by walking; the Mérida cable car, was the highest and longest cable car in the world when it was built, and only reaches Pico Espejo. From there it is possible to climb to Pico Bolívar. The peak is named after the Venezuelan independence hero Simón Bolívar. The Pico Bolívar is located on the mountain previously called La Columna, next to El León (4,743 m) and El Toro (4,695 m). The new name was suggested by Tulio Febres Cordero in 1925. It was officially renamed on December 30, 1934. The height of this prominent Andean peak has been estimated and calculated various times during history. In 1912 one triangular measurement pointed at 5,002 metres. In 1928 came another calcutation at 5,007 metres, which stood as official height for a long time. During the 1990s the scientists Heinz Saler and Carlso Abad estimated the height, based upon GPS observations to be 4,980.8 metres. However, no validation was made. New GPS measurements were made in 2002, which stated a height of 4,978.4 ±0.4 metres. These more correct findings were published in 2005. The final measurement was made by José Napoleon Hernández from IGVSB; Diego Deiros and Carlos Rodriguez from USB and two guides from Inparques. GPS measurements designed for geodetic network consists of the vertices Pico Bolívar, El Toro, Piedras Blancas, and Mucuñuque Observatory, the latter belonging to the Venezuelan Red Geocentric REGVEN. Measurements were temporally equally long and continuous to ensure a greater volume of data over time to make more consistent and reliable information, five (5) GPS dual frequency receivers were used. Comparison between the mountain's glacier, 1950 and 2011 respectively. During the Merida glaciation in the Pleistocene epoch, the glaciated area had a maximum extent of 600 km2 and covered mountains with a height of at least 3,000 m. At the end of the glaciation, the area covered by the glaciers progressively shrank, and before the start of the Little Ice Age they had possibly all disappeared. It is estimated that in 1910 the area covered by glaciers was around 10 km2, divided in two large areas, one embracing Picos Bolívar, Espejo and Concha and the other embracing Picos Humboldt and Bonpland. Possibly a small glaciated area covered the northwest side of Pico El Toro. Aerial pictures taken in 1952 show the glaciated area had already shrunk to 0.9 km2 for the Picos Bolívar, Espejo and Concha and to 2.0 km2 for the Picos Humboldt and Bonpland. In 2003 almost all the glaciers of the area had disappeared, with the exception of a two small glaciated areas (7.48 Ha on Pico Bolívar and 35.81 Ha on Pico Humboldt). It is forecast that at the current rate Venezuela will lose by 2020 all its glaciers, making it the first Andean country without any glaciated area. Panoramic view of Pico Bolívar. ^ a b "Venezuela, Brazil and the Guianas Ultra-Prominences" Note: The prominence value given here is based on an elevation of 4,981 m. Peaklist.org. Retrieved 2013-02-12. 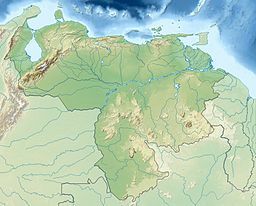 Wikimedia Commons has media related to Pico Bolívar. This page was last edited on 26 January 2019, at 18:06 (UTC).